This card was made using Butterfly Swirls by The Angel Company. I stamped the images with Versamark on White Glossy paper. After it was dry, I swirled E-Z Walnut Ink Tintz in Rose, Verdigris and Denim all over it. 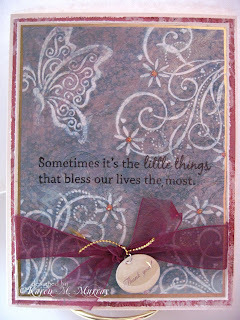 I then stamped the sentiment in Palette Noir and added Fruit Punch Stickles to the flower centers in the swirls. I went along the edge with my Krylon gold leafing pen, then tied my ribbon. I matted it on Curious Poison Ivory and paper from the DCWV Old World Stack after lightly distressing the edges. Bird Update: I am really worried about this bird. He doesn't seem to be growing and his brother flew away days ago. I hope he is okay. Such a lovely card Karen!!! I hope that little birdie is ok. Keep us updated. I came upon your blog true Chris. And i love to see what you are doing with the stamps from TAC.